Earin earbuds are completely wireless and can recharge themselves | What Hi-Fi? To many, wireless earphones are usually minus the cable connecting to your smartphone, iPod or other audio source, and have only the connecting cable between the earphones themselves. Earin – a new brand created and led by Olle Lindén, who's worked with companies such as Nokia and Sony Ericsson – has announced a new set of earbuds with a difference. A Kickstarter project, the Earin earbuds do away with the connecting cable, meaning you're left with two individual buds to insert into your ears. The earbuds weigh 5g and sport a plastic casing with a silicon tip to create a noise-isolating fit in the ear. They measure just 14mm in diameter and 20mm in length and connect to your audio device via Bluetooth 3.0 and 4.0. The Earin earbuds are fitted with a 50mAh rechargeable Li-Ion battery, which claims to offer up to three hours of playback time. They also come with a storage capsule, which is fitted with a 100mAh Li-Ion battery capable of recharging the earbuds when they're not in use (the capsule is recharged via USB). 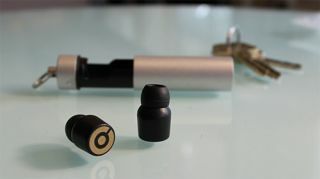 The Earin earbuds come bundled with three different foam tip sizes as well as a "Concha lock". The Concha lock is a wing-like attachment formed from silicon to create a more secure fit. The Earin earbuds are currently halfway toward their Kickstarter goal of £179,000 and customers who pledge £99 or more will guarantee themselves a pair of Earin earbuds and a wireless charging capsule upon launch, which is expected to be January 2015.